A refugee football player has returned home to a celebrity welcome in Australia hours after the threat of extradition to Bahrain was lifted three months after he was detained in Thailand. 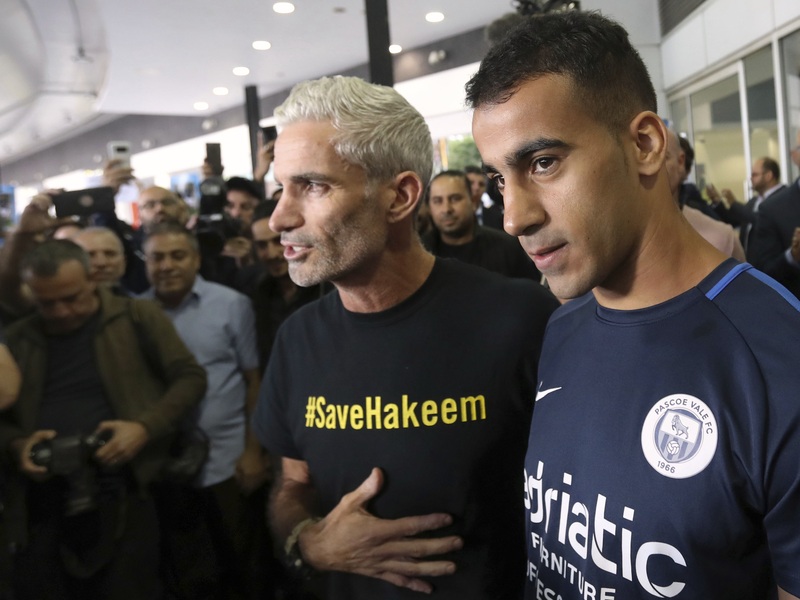 Hundreds of supporters carrying welcome signs were waiting at Melbourne Airport on Tuesday when Hakeem al-Araibi arrived on a commercial flight direct from Bangkok. Thailand had come under great pressure from Australia’s government, sporting bodies and human rights groups to free Mr al-Araibi so he could return home to Australia, where he has refugee status and plays semi-professional soccer. Former Australia national team captain Craig Foster has been leading the campaign for Mr al-Araibi’s release. He said he could not sleep until he received word from Bangkok that Mr al-Araibi’s flight had left. Mr al-Araibi told the cheering crowd: “I would like to say thanks to Australia. Thailand had come under great pressure from Australia’s government, sporting bodies and human rights groups to send Mr al-Araibi back to Australia, where he has refugee status and plays semi-professional football. Prime Minister Scott Morrison, who wrote twice to his Thai counterpart Prayuth Chan-ocha in a bid to secure Mr al-Araibi’s freedom, thanked Australians as well as Thai authorities. “I want to thank all Australians for their support in achieving this outcome,” Mr Morrison tweeted. [2/2] We have also appreciated the constructive dialogue we’ve had with Bahrain to resolve this. We look forward to seeing you home, Hakeem. Two Australian expert cave divers who had helped rescue 12 boys and their soccer coach from a flooded Thai cave in July also wrote to the Thai prime minister last week pleading for Mr al-Araibi’s release. Anesthetist Richard Harris and Craig Challen, a retired veterinarian, were last month named joint winners of Australian of the Year Award trophies, one of Australia’s most prestigious awards. “The issue had just gained more and more prominence and Richard and I both realised that we’re in a position to hopefully give the issue a little bit of a nudge and contribute in our own little way,” Mr Challen told Australian Broadcasting Corp.
Thai prosecutors on Monday submitted a request to a court to withdraw the case to extradite Mr al-Araibi to Bahrain, where he faces a 10-year prison sentence for an alleged arson attack that damaged a police station. He has denied those charges and says the case is politically motivated. Prosecutors made the decision after Thailand’s foreign ministry sent their department a letter on Monday indicating that Bahrain had withdrawn its request for Mr al-Araibi, a Thai official said. Officials in Bahrain said the country “reaffirms its right to pursue all necessary legal actions against” Mr al-Araibi. Mr al-Araibi, a former Bahraini national team player, says he fled Bahrain due to political repression and that he fears torture if he returns.